New 6" Marvel Legends Infinity War Store Exclusives and #HeroActs – AiPT! Hasbro has revealed three Marvel Legends multi packs for the Avengers: Infinity War. You may have heard about them, like I have. But now we finally get to see what they look like. Scarlet Witch and Vision have a release date of 3/3/2018 and is a Toys R Us exclusive. 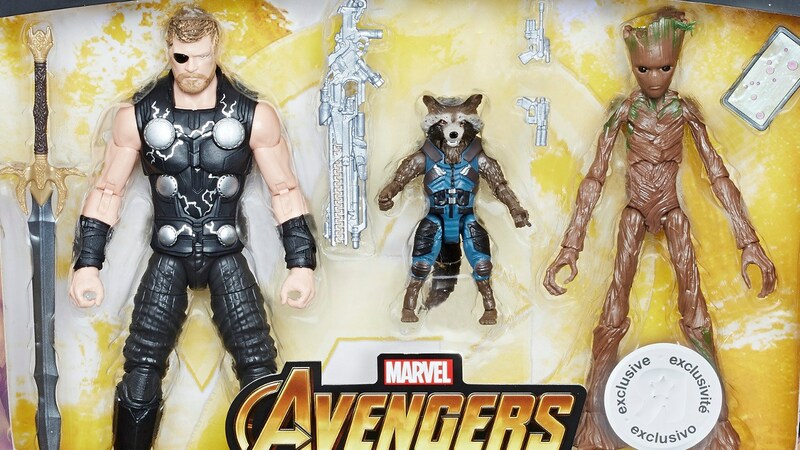 Thor, Rocket Raccoon, and Groot have a release date of 6/1/18 and is also a Toys R Us exclusive. And finally, Bucky and Falcon have a release date of 6/1/18 and is a Target exclusive. The action figure reveals tie in with “Marvel: The Universe Unites”, a week-long charity event that will see the stars of Avengers: Infinity War team up for a series of #HeroActs and social media challenges to raise funds and awareness for charities that support children and families impacted by serious illness. According to the Walt Disney Company, the initiative will culminate the weekend of March 3rd when shopDisney.com and Disney stores in the U.S. will donate 10% of sales of all Marvel products made between March 3-4, 2018 (up to $50,00) to Make-A-Wish to help grant life changing wishes for children with critical illnesses.